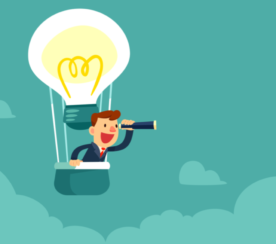 Google Trips: What are the Opportunities for Businesses? 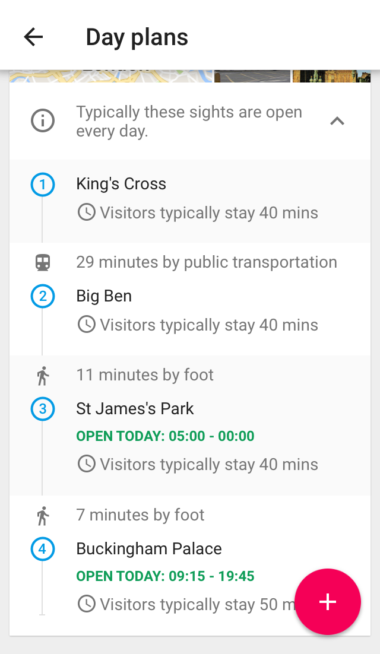 With the release of the Google Trips Android and iPhone app earlier this week, I decided to plan and visit London using the latest app from the search engine giant to see what opportunities there are for local businesses and their marketing teams alike. 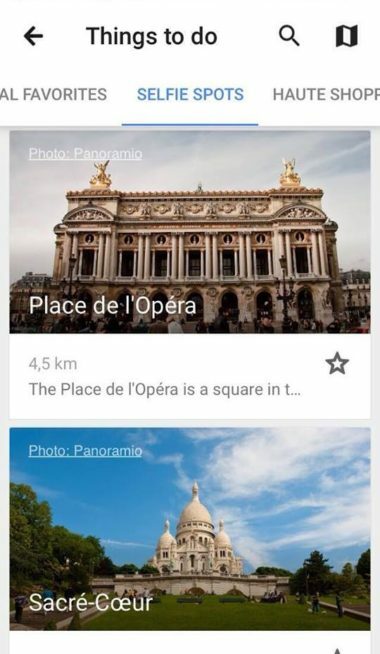 Google Trips is a personalized tour guide in your pocket. In the past, you may have resolved this by paying for a tour guide or a tour book. 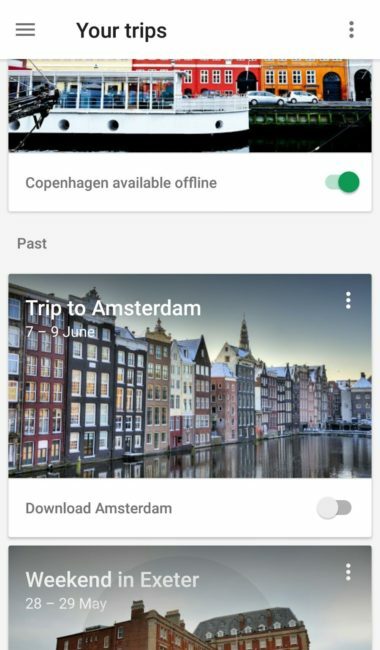 Now you can save your pennies with Google’s free Trips app. You can even download your destination before you go to save on WiFi bills moving around the city. You can download the app on Android and iOS. In their press release, Google stated they wanted to solve the stress that many people face when planning their holidays. A GoodThink study found that 74% of travelers are most stressed when it comes to figuring out the details of their trip – transportation, working out what to do, an unfamiliar location, etc. The first eye opener on the app is that Google has scraped by Gmail emails and reminded me of previous holiday trips I have been on. It also automatically creates trips based on any travel information in your Gmail account – flight confirmation, hotel bookings, restaurant reservations, etc. Google already knows I will be in Berlin, Germany next month! Ahead of your trip, you can instantly plan each day of your holiday with just a few taps of your finger. The app contains significant information, picked up from Google Knowledge Graph and manually edited by Google staff. Each city has different sections, for example, London has Literary London, Art Destinations, Historic London, Posh Shops, Local Favourites, Wartime London, Vintage Shopping, Gothic Churches and Quirky Museums. While Paris has Revolutionary Paris, Small Museums, Impressionist Art, Cutting-Edge Art, Parks & Gardens, Haute Shopping, Vintage Shopping, Food Shopping, Local Favorites, and Selfie Spots. Interestingly, there is no Selfie Spots section for London! The app is clever in being able to estimate motorway delays and even discovering when restaurants are most busy. Knowledge Graph helps Google determine the most popular places and what tourists like to do when traveling. You can plan all of your sightseeing in advanced with maps and directions, distances and walking times between landmarks, and download your day plan so you do not need to worry about WiFi bills once you arrive. Select from either pre-defined Google day plan suggestions (based on other visitors’ historic data) or create your own day plan. The + button in the screenshot above allows you to see other attractions nearby. For the top 200 cities in the world (according to Google), Google Trips gives you a variety of Day Plans, Reservations, Things to Do, Food & Drink and more, all at your fingertips. For those outside the top 200, there are still the Google Local Listings. 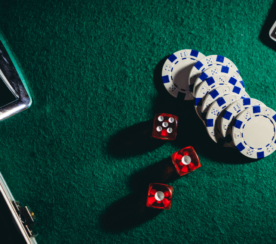 With a Food & Drink section, there is ample opportunity for restaurants, bars, cafes and such to appear when visitors are both planning their trip or while they’re close by. 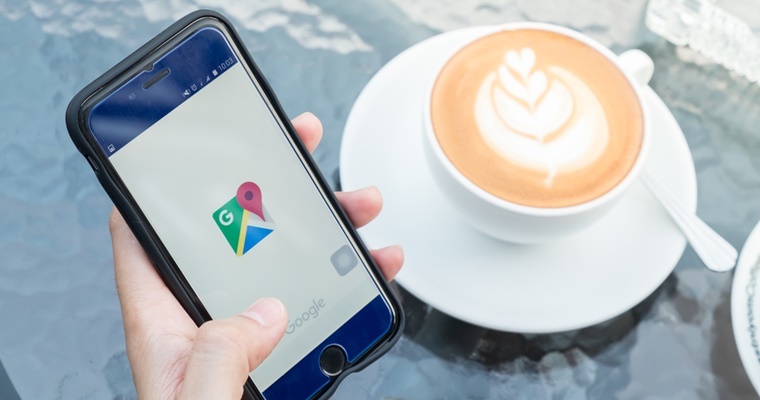 This means that, with Google’s latest app, completing your Local Listing correctly and getting positive reviews couldn’t be more important for your business. 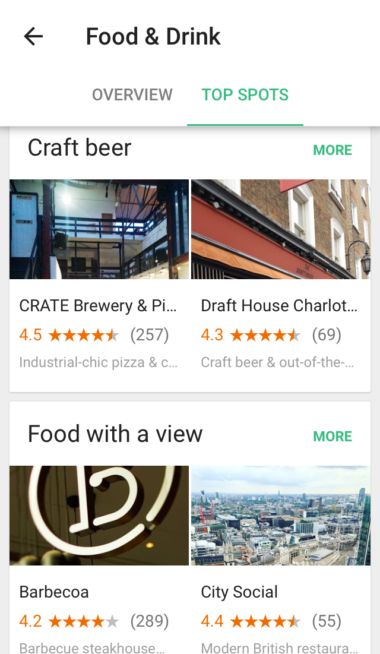 While I was in London, the results showing up on my searches for restaurants and cafes all came back with a rating of 4.0 or more and at least 40 reviews – this will come as a surprise to no one that the number of reviews and higher the rating contribute significantly to where you show up. For the record, restaurants and cafes in villages outside of London were showing up with ratings as low as 3.5 – not as much competition. Location is another significant factor of course. So make sure that you complete your Local Listings page correctly and with as much information as possible if you want to show up both in Google Maps and on Google Trips. Google previously published its guide to improving your ranking in local results – Relevance, Distance, and Prominence. 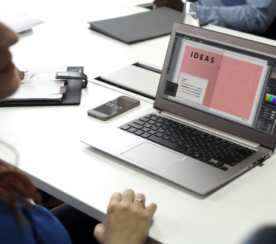 They also state in their Local ranking guidelines that information from links, articles, and directories, as well as reviews and positive ratings are a factor in your position in the web results – one would presume this will be very similar for Google Trips also. Google Trips is essentially a free version of TripIt. User reviews and Google’s historic data will make it a dream for tourists. This app has the potential to become hugely popular, meaning that ranking in Local Results could be more important than ever for small businesses and chains alike.